Tonight I heard my President call for America to respond to a "Sputnik moment." It was, in a sense, a call to arms. I liked this call. In October of 1957, Russian scientists launched a beach ball-sized satellite into space in a move that rocked this country and kicked off a race to stab a flag into the dusty surface of the moon. The spirit of competition that spurred us to win that race was unfortunately mired in fear and distrust. What President Obama is hoping for in this case, I think, is for the American people to seize on an opportunity to surge ahead in the world based on something much more positive. Even with the lagging recovery of our economy, even with our high unemployment rate, ours remains to be a great, resourceful nation. We are smart, strong, and wealthy, and underneath the blanket of icy deficits and corporate scandals, still there springs a blade of optimism. It's what we're raised to believe here in the United States: that we are the greatest nation in spite of what anyone else has to say, in spite of evidence to the contrary. In our worst moments, that belief sounds and appears arrogant. Arrogance taints foreign policy, corporate cooperation, and even entrepreneurship. But once we've been knocked down a peg or two by the realities of commerce and a shrinking globe, the seeds of that arrogance which remain embedded within each of us can be relied upon to quicken our own recovery. Blind patriotism may be ignorant, but stubborn patriotism, well-worn patriotism, patriotism with a little scar tissue... that might just kick start us again. Innovation. I wish I had the mind for it. Jonathan does. I've watched him conceive brand new ideas and implement them dozens of times. When he thinks, he moves laterally, diagonally, outside of the space in which all normal people reside. His is the mind of an explorer, an astronomer. I can only hitch my wagon to his star when it comes to innovation. But I am happy to lend what talents I do have to the recording of his innovations, and that's precisely the point. While some are born to create change, others are born to implement it. Still others are born to be watchdogs, scribes, judges, and repairmen. That's basic anatomy; a body consists of myriad parts. I wish Obama's speech had been given in the style of one of FDR's fireside chats. I think the speech would have been edited differently in that case. Less ceremony, less glad handing. Less winking and nudging. Less rhetoric. Maybe. Probably not. But if he hadn't needed to worry about punctuating every other sentence with applause, the core of his speech would have been more powerful. Forget the storytelling. Remember that he reminded us to recognize the opportunity that is ours, the chance to reassess and reboot a few things, to carry out a few controlled burns, and to rise from the ashes a stronger and more prepared nation. Blaming one another for what seems to have gone wrong is easy, and it's the most common kind of trap. A pointing finger is not accomplishing anything. Know what part you can play in bettering yourself, your own family, your company, your church, your community. Then do it. Innovate. Or recognize the innovations of someone you trust and reach out to help implement them. Encourage those who are working to create a better way of life. Only criticize if you have something constructive to offer, as well. It's that kind of positive thinking and action that will fuel our upward trajectory. And acknowledge your patriotism. We haven't been sucker punched in a while, so it's easy to forget that our entire country has knotted together under the waving flag within the last ten years. That flag, those colors, and the impressive arc they make overhead as they're waved are not only about the arrogance of America. That's part of it, certainly, but only the better part, the stubborn pride that has been hard earned by a survivor of many wars and depressions. More than that, the flag is about unity and strength in those numbers. It is about an appreciation of our history and the willingness to learn from our mistakes. It is about an acceptance that we'll make new mistakes, too, and a belief that we'll come through all of it okay. I love that flag. I love the allegiance I feel to my country and my countrymen. And furthermore, I love that as technology improves and the globe seems to shrink, my allegiance can broaded to include more than only my nation. I feel an allegiance to this planet and the semblance of peace I believe we must achieve in order to remain here. This brings me to the other reason I responded strongly to Obama's use of Sputnik as a catalyst for our country's improvement. Two days ago, a pair of suicide bombers carried out an attack on Moscow's Domodedovo airport. The blast killed 35 people and wounded 180 more. This is the second major terrorist attack on Russia's capitol in the last year. 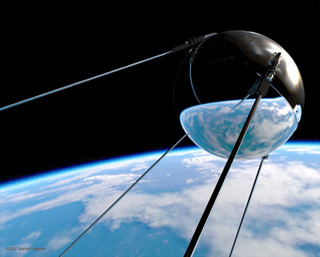 In 1957, the launching of Sputnik solidified the cold war between Russia and the United States of America. Today, we share a common enemy. President Obama's reference to the satellite was most definitely a call to action for the American people, but I think it was also an extended hand to the nation most recently devastated by terrorism. After all, Sputnik was proof that the Russians were innovating, and beating us to the punch all those years ago. They were a worthy opponent then. Today, I say they are a worthy ally in our fight against religious extremism. My prayers are with the people of Moscow. Let's hope that some of our generation's innovations, coming from all countries interested in a world of tolerance and peace, will expedite an end to this war. If I'm right and if we're fortunate, those innovations will come more often and most effectively in the form of education, foreign aid, and volunteerism than in the form of weapons. Here's hoping for the next Sputnik. Let's rise to the challenge.